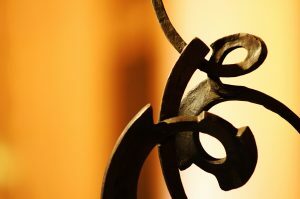 In recent years, many Houston homeowners have taken to decorating their home with rustic decor. This popular type of interior design commonly features elements made from the unique combination of wood, metal, and glass, providing an old-world charm that creates a cozy, inviting atmosphere in any room. At M&M Lighting in Houston, we make it easy to find rustic light fixtures to add the finishing touch on your indoor spaces, and whether you are shopping for chandelier lights or landscape lighting, you’re sure to find what you need when you visit our expansive showroom. Schedule your appointment with a sales consultant today! Incorporating rustic elements into your lighting design is easy when you know what you are looking for. 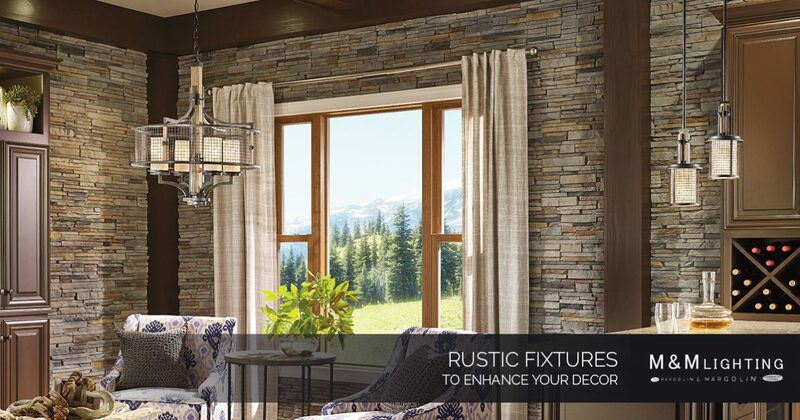 In today’s post, our team will highlight a few of our top picks for rustic fixtures. Read on to learn more. Whether you are looking to add an element of accent lighting to your home office or enhance an existing focal point in your living room, wall lights are an effective way of incorporating decorative lighting in your home. The Nadra one-light wall sconce from ELK Lighting features a vintage Edison bulb surrounded by a dark brushed gray rectangular cube framework that measures 12 x 6 inches. In sharp contrast to the rich finish, the light bulb is held in place with a polished gold spun socket holder for a truly unique look. When hung in a grand foyer, the right fixture will welcome your guests in style and provide stylish illumination to the space for those who are coming and going. Arteriors is a lighting manufacturer known for its innovative and artistic chandelier lights, and their 27-light inverted chandelier from the Geoffrey collection is a classic example of their stunning creations. This fixture features three rows of Edison bulbs for ample illumination of your grand entryway, and the gray wood frame and metal chain combination is rustic decor at its finest. Over the last few decades, master bathrooms have evolved from being simple, utilitarian spaces to rooms that are deserving of their own design elements. If your current Hollywood vanity light strip is taking away from the rest of the room’s rustic design, why not replace your fixture with one that complements your decor? Featuring cast metal sockets, pipes, and valve wheels mounted to a multi-tone weathered wood panel, the Jonas vanity light from ELK Lighting is sure to add the right element of rustic design to your master bathroom. Are you searching for the perfect pendant for the rustic-themed bar in your basement, or do you need stylish task lighting in your kitchen that complements your rustic decor? Look no further than the one-light pendants in the Levone collection from Uttermost. This gorgeous pendant light features a cone-shaped metal shade with an oxidized bronze finish and exposed rivets to provide a unique fixture for the right space. Not only will it enhance the aesthetic of your room, but it will surely be a topic of conversation amongst guests. Who says that ceiling fans have to be boring? If you still have the contractor-grade ceiling fan in your bedroom, it might be time for an upgrade to a fixture that provides gorgeous illumination and refreshing air flow. The design experts at Minka Aire are known for their innovative fixtures, and their five-blade rustic fan from the Rainman collection doesn’t disappoint. Each blade is finished with a smoked iron stain to give the appearance of metal, and the center oversized Edison bulb is enclosed in a wire frame for rustic charm. Rustic Chandelier Lights and More in Houston! Are you tired of shopping around your local retailers only to be disappointed when you are unable to find the rustic fixtures you are searching for? You may not be able to find the lighting solutions you want from big box stores, but you’re sure to find the right fixture for your needs when you shop the M&M Lighting showroom in Houston. From wall lights and chandelier lights to bathroom fixtures, pendants, and ceiling fans, we have it all! With more than 50 years of experience in the lighting industry, we have the knowledge and skill to help you choose the best rustic lighting designs for your home. Let us inspire you — contact a friendly member of our team now to schedule your appointment!